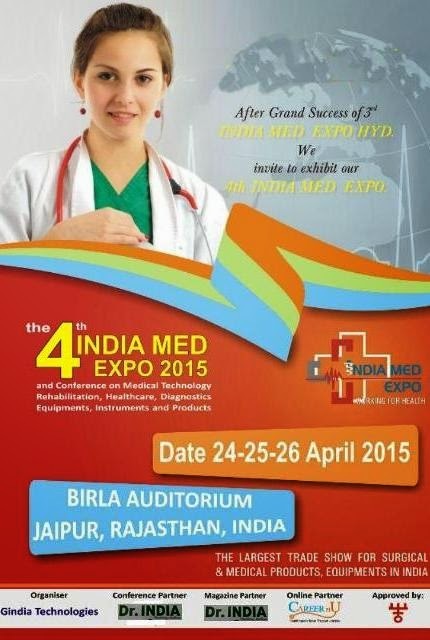 India Med Expo is India’s Top Medical Expo organized by G India Technologies. It brings together the best in the business of hospital, diagnostics, medical and rehabilitation equipment's and supplies. The trade fair’s biggest advantage is that it draws the highest percentage of hospital owners, doctors, medical directors and purchase heads from all over India and abroad. We also get the best dealers and distributors coming to INDIA MED EXPO show every year. INDIA MED EXPO 2014 saw over 6500 business visitors including about 900 conference delegates. INDIA MED EXPO 2013 saw over 5000 business visitors including about 600 conference delegates. INDIA MED EXPO 2012 saw over 3500 business visitors including about 400 conference delegates. INDIA MED EXPO 2013 Visiting countries: India, Nigeria, South Africa, Ghana, Pakistan, Malaysia, Srilanka, Bangladesh, Nepal and Bhutan. In India Med Expo 2015 there will be around 7000 visitors and 1500 delegates. We are pleased to intimate you that India's largest medical & healthcare exhibition‚ India Med Expo 2013 is going to be organized from date 06-to-08/12/2013 at Hitex Exhibition Center Hyderabad. On this occasion, more than 350 companies, 1500 delegates, 14000 trade visitors & Medical Colleges are expected to be there. It is going to be a golden opportunity for all concerned to be benefited in their business matters & could have direct interaction with importers, buyer’s & manufactures. They could also get Reliable, cost-effective & innovative products along with a comprehensive range of diagnostic equipment and solutions‚ medical furniture‚ medical consumables‚ surgical equipment, instruments, products & medical vehicles, doctors‚ hospital and all concerned in medical & health care-field.